December 17, 2017 0 comments on "Kris Kringle Cookies"
I have tried a lot of different Christmas cookie recipes over the years. Every year I like to try at least one or two new Christmas cookie recipes to add to my cookie collection. This year I decided to try these Kris Kringle cookies. 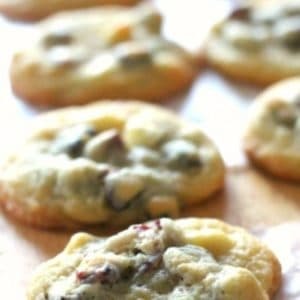 They are similar to chocolate chip cookies, with the milk chocolate chips replaced with white chocolate chips and dried cranberries. Yum! I think we have a new favorite Christmas cookie recipe. It will be a perfect cookie recipe for Christmas cookie exchanges. Heat oven to 375 degrees. Beat the butter and sugar in a large mixing bowl until mixture is light and fluffy. Add eggs and vanilla extract. Next add flour, baking soda, and salt, mixing well. Gently stir in the white chocolate chips and dried cranberries with a spoon. Drop the dough by rounded spoonsfuls onto a lined cookie sheet. I like to use a cookie scoop to make sure all my cookies are the same size. I also use these non-stick baking mats to make sure that my cookies don’t stick to my cookie sheets. Bake cookies for 8-9 minutes, and take them out of the oven when they are just starting to brown around the edges. If your cookies look too flat, place the remaining cookie dough in the refrigerator and let it chill for an hour so before making the rest of the cookies. Let the cookies cool on the baking sheets for a minute before removing them to cool completely on waxed paper or wire baking racks . These cookies freeze well, so if you need to make them ahead of time, place them in freezer bags and freeze them for 4-6 weeks in the freezer. These cookies are very festive and taste amazing. They make a great addition to your holiday table and are great for holiday or Christmas cookie exchanges. Like this recipe? You might also like my recipe for chocolate no bake cookies. You might also want to check out these fun ideas for making a DIY Santa’s Grotto.